I love this recipe. I wish I were eating it RIGHT NOW! It’s really heavy and really bad for you, but those are the best kinds, right? It’s also safe for the elimination diet! Preheat the oven to 375 degrees. Cook your pasta and at the same time pan fry the sausage. 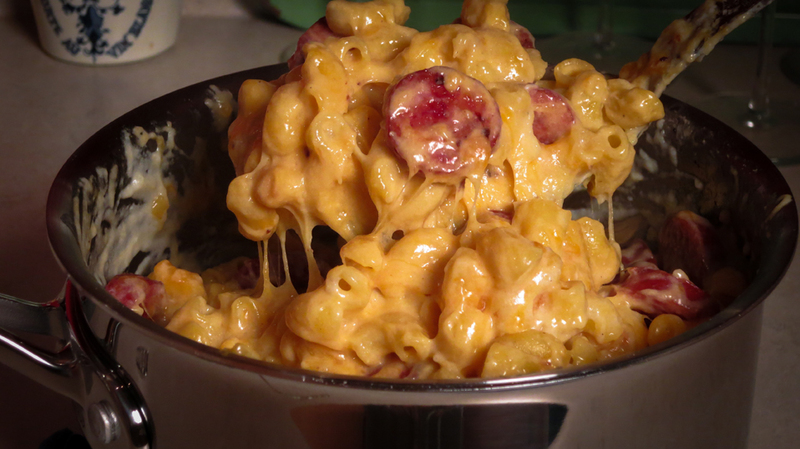 In a 2 quart oven-safe dish, alternate layers of the cheese, pasta, and sausage. In the pan you used for the sausage, melt the butter and blend in the flour. Stir in milk, salt and pepper. Stir while bringing to a boil, and boil for 1 minute. Pour the sauce over your pasta/sausage layers. Bake in the oven for 15 minutes. ***Be careful! A lot of sausages have garlic or corn syrup added, but this one is safe. This entry was posted in Recipes and tagged elimination diet, fructose malabsorption, hillshire farm lite smoked sausage, macaroni and cheese, pasta by nosugarlessgum. Bookmark the permalink. This looks amazing. My 6 yr old son has FM, and he seems to tolerate corn flour pasta ok. But I still have not gotten him to a place where he is not in constant pain. Is there something ab corn flour I could be missing? We are only a year into this journey, and it has been so hard. Thank you for this very insightful and “real life” blog. I’m sorry to hear that your son is still in a lot of pain. Keep me updated! I would love to know how things progress!